We define “Just in Time” video content as content that has been created and posted in a short amount of time to address a time sensitive, or situational need. This is different from normal course videos that should be created with the Media Team’s participation. You have a lot of options for what tools when shooting your own video for use as just in time content. Pocket Video Cameras (Flip Video, Zi8, etc.). The process for creating your video can be broken down into 4 parts. It is always a good idea to think through and organize the points you will cover in your video. This will help keep your videos short and to the point. We recommend you read through the Fundamental Video Concepts section of our Video Basics documentation for a quick overview of important things to remember when recording your video. It goes over important things like lighting, sound, and tripods. Always give your video a peak before uploading it. Make sure the audio is nice a clear, and that the video looks good. Since this is just in time content, we are not looking for amazing quality video. We want to be sure you can see and hear the content clearly. First we need to get your video from your camera to your computer. This process can vary depending on the computer and/or camera you are using. Generally it involves connecting the camera via USB cable, or removing the memory card from the camera and inserting that into your computer. Then copying the needed video file to the computer’s hard drive. In most cases, this works the same way as how you would copy photos from your digital camera. At the top right-hand side of most YouTube pages is an Upload button. Click it, and you will be taken to the YouTube upload page. 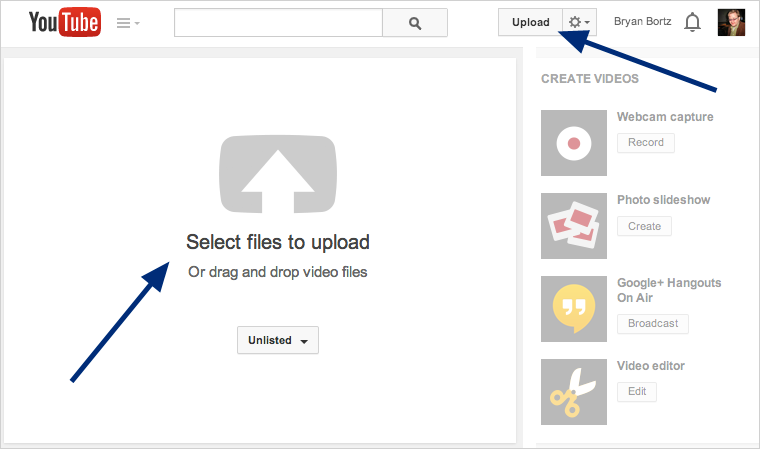 Click “Select files to upload” to select the video file you are uploading. Once you select your file, it will start uploading. While it is uploading you will be able edit the video’s attributes and settings. For just in time content we are only concerned with two settings, the title of the video and the privacy setting. The title will help keep things organized. The privacy setting effects who can find the video. It is recommended you set the privacy setting of the video as “Unlisted”. This will keep the video out of search results, and still allow you to embed the video inside of D2L. Next we need to embed the video into the course. This is done via some HTML referred to as “embed code”. 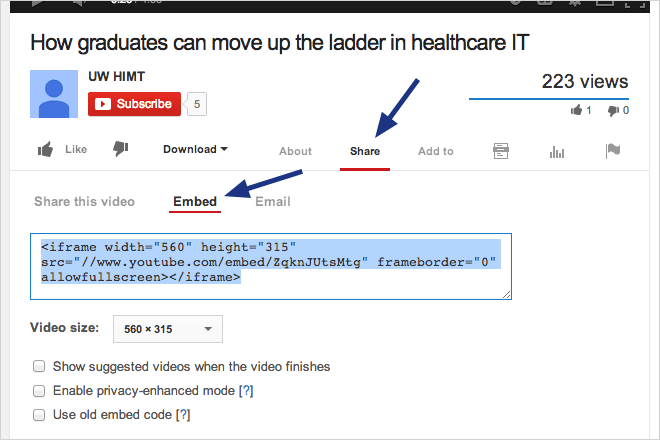 The embed code can be found by first navigating to your video’s YouTube page (The upload page should display the link to your video). Underneath the video you will find find a link named “Share“. When you click “Share” various options for sharing the video will appear below it. Here we want to click “Embed“. This will display the embed code HTML that we need. We will copy and paste this complete chunk of code into D2L. In a new browser window or tab navigate to the page in your course where you would like to embed the video. Click “Edit” to open up the D2L editor for that page/content. In the toolbar you will see an “Insert Stuff” button. Click it to open the “Insert Stuff” dialogue. On the left hand side you will see a list of types of “stuff” you can insert or embed into the page. Select Enter Embed Code. 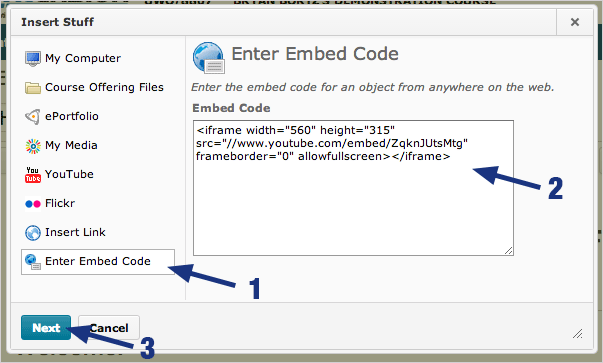 This is where you will paste the embed code from your YouTube video. Once it is pasted in, click next to see a preview of your video. 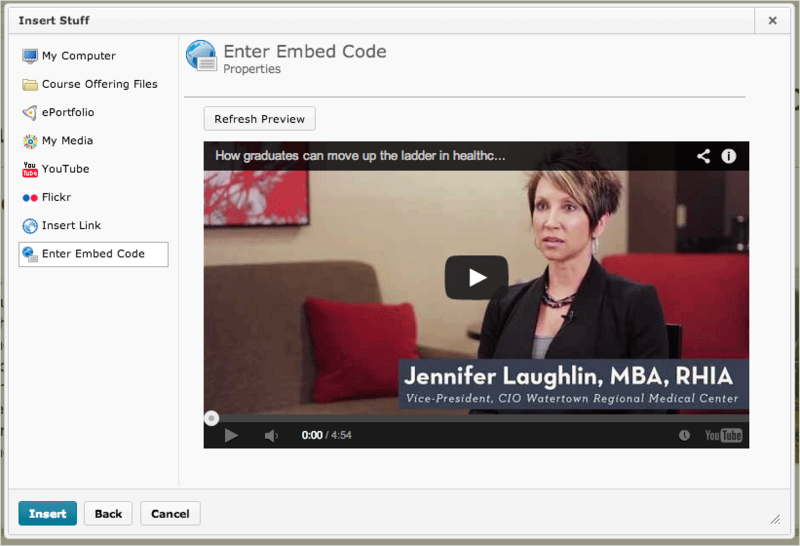 If everything looks ok, click “Insert” and your video will be placed in the D2L editor. Click the blue “Save” or “Update” button at the bottom of the editor when you are done editing the page. Published on June 12, 2015 at 12:42:10 pm CDT. Last modified on June 06, 2018 at 4:00:35 pm CDT.